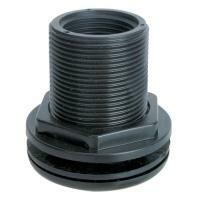 Brief Description: The ultimate in phosphate removal for fresh water and sea-water aquariums. Notify me when "ROWAphos GFO Phosphate Removal Media [100 mL]" is re-stocked. RowaPhos is the professional method of removing phosphate and silicate in all types of aquariums and ponds. Unlike most other phosphate removers on the market which are either naturally occurring aluminium based products made from zeolite or made from byproducts of other chemical processes, RowaPhos is an engineered chemical product manufactured specifically for removing phosphate from water. 1000 mL will remove phosphate as high as 3ppm in 8000 liters (2000 gal.) of freshwater and 4000 liters (1000 gal.) of saltwater. Germany for treating mains water supplies. As such it should not be confused with natural materials, which are generally based on aluminium oxide, (zeolite). RowaPhos is manufactured using a Patented process which makes it physically and chemically completely different to the vast array of other iron based media which have sprung up to ride on the sucess of the Rowa product. Most of these products are iron oxide based and have a higher capacity for phosphate than aluminium based medias but do not touch the engineered properties of RowaPhos. In an independent series of tests carried out by the Berlin Technical University on the five most commonly used phosphate removers at the time, RowaPhos was found to be the most efficient in removing phosphate from water. Other medias tested reached only to 30 – 40 % of its removal capacity by weight. Additionally RowaPhos was found to continue to remove phosphates at lower concentrations and had a higher maximum holding capacity. 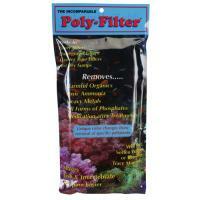 In regular conversations with hobbyists around the world it has become obvious that many people currently using Rowaphos have no real concept as to its correct use within the aquarium and use it like ‘magic pixie dust’ on its reputation alone. They have it a small pouch of media in the corner of their tank or sump and have no idea how it works or even what their phosphate level currently is. I know that this is true as I was such an individual once. Phosphates are naturally occurring inorganic salts, which are found in all living things. They can therefore be introduced into the aquarium from a wide range of sources such as; from fresh water supplies for those not using R.O. water; from decomposition of uneaten food or fish waste; from death of plants and animals in the tank; from impure aquarium chemicals such as cheap activated carbon: or by slow release of absorbed concentrations from rocks and tank substrates. What is the effect of phosphate concentrations on my tank? Within the reef aquarium, phosphates will greatly affect the formation of hard coral skeletons by reducing calcification by over 50% and by inhibiting the deposition of strontium. It is suggested by Borneman that phosphates are a direct poison to calcification. For other aquarists with fresh or salt water tanks the main drive behind the purchase of Rowaphos is to control the growth of nuisance algae within their aquariums, which can in some cases overrun plants and expensive corals spoiling the aesthetics of the tank and in extreme cases killing its inhabitants. Phosphates are food for nuisance algae along with other nutrition such as nitrates and light. The problem often becomes worse or apparent when changing to more intense lighting such as to HQI or T5 units. Tullock states that there is no simple way of controlling excess algae, as there are a number of factors involved, however in most aquarium situations the limiting nutrient ion in terms of algae growth is phosphate. 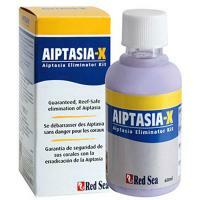 Phosphate limitation is therefore the single most effective means of algae control to the aquarist. Each pack of RowaPhos clearly states the volume of water that the contents of the pack will reduce in phosphate concentration by 3 ppm. 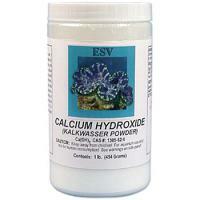 Note that it is 2 times more effective in fresh water than in salt water. 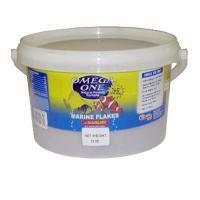 Many people take this stated volume, often on the smaller packs, and see that it is the same size as their own tank. They then hand over their money, take it home and pop it into their tank to be forgotten about for the next few months before beginning the cycle again. In reality most people starting to use phosphate removers for the first time will probably have concentrations of phosphate in excess of 5 ppm in their systems and even more bound up within the rocks and media requiring a pack size suitable for removal of 3 ppm from 2-5 times their tank size or more to bring the initial concentration under control. The reality for someone blindly using RowaPhos is that they start off at 5 ppm and reduce it to 4 ppm by using the wrong sized pack, which they replace after 2 – 3 months by which time the concentration has returned to or exceeded its original level. Reduction to 4 ppm was a total waste of their time and money, as the phosphate levels must be ideally reduced to almost zero or at least below 0.01 ppm as PO4 (0.03 as P) in order to starve out the algae. How do I test for phosphate? Unfortunately in our opinion there are only two testing kits on the market that are sensitive enough to measure phosphate concentrations accurately down to the required levels. Other tests will indicate a zero reading but this is not necessarily the case when retested with a more sensitive kit. The D-D high sensitivity test kit manufactured in association with Merck is a professional test kit designed as a half size standard Merck test kit which are laboratory grade and generally too expensive for the average hobbyist. The second recommended test kit is the one manufactured by Salifert, which is also sensitive at low levels but in my opinion still makes it difficult to differentiate between the colours due to the poor optical clarity of the sample container. What level should I have in my aquarium? In saltwater aquariums and reef aquariums in particular we would recommend that your phosphate level is maintained at between zero and 0.05 ppm (PO4). Some test kits may express the results as the concentration of phosphorous ion P and in this case it should be below 0.015 ppm (P). In freshwater aquariums, RowaPhos is twice as effective for removal of phosphate and we are generally using the media for controlling nuisance algae. We recommend that you keep the level below 0.1 ppm (PO4) or 0.03 ppm (P). How do I use RowaPhos? There are several ways of using RowaPhos depending on the aquarium size or the budget. The smaller packs of media, which are often used by people with smaller tanks or those first starting to control phosphates contain a net sock into which the media can be placed. The way that RowaPhos works is by chemical adsorption onto the surface of the media and hence for it to work properly it is necessary for water to flow around and through the pouch. It is also recommended that the media is regularly disturbed to prevent compaction and expose new areas of the surface to the general water flow. The second way of using RowaPhos is in a conventional canister filter. It is possible to put the above sock straight into the canister however this has a tendency to channel or compact, which is exacerbated by the use of Kalkwasser, which can solidify the media in the same way that it does so to the sand in a plenum system. It is therefore preferable to layer the RowaPhos between sponges or floss to create a more uniform flow and show a higher surface area to the water. Deltec have developed a range of fluidised reactors specifically designed to allow a high water flow without over fluidisation. Do I wash the media first? For use in a fluidised reactor we recommend that you wash the media in R.O. water prior to use to remove the fines, which would otherwise over fluidise and end up in the aquarium. If this happens it will not cause any harm to the inhabitants as it is inert but may look unsightly for a while. For all other applications we recommend that you follow the instructions supplied with the pack and do not wash RowaPhos as you are removing active material and may deplete its capacity by removal of phosphates from the water that you are washing it in. The unwashed material will initially colour the water brown but with good water flow will quickly disperse and have no negative effects on the health of the aquarium. How long is a piece of string? If used for initial higher levels, having done its job, it could become saturated within a few days or may last for months once the aquarium has reached zero. Unfortunately there is no substitute for regular testing and changing of the media once levels start to rise. In a canister or fluidised filter, when used at the correct levels, the return water back to the tank should always read zero or at least be less than the background level within the aquarium, (assuming that that is not also zero). It is possible to reduce the flow through the reactor until the return water measures zero phosphate or to increase the amount of RowaPhos to achieve the same result. As soon as the media starts to become loaded the level will rise to the same level as within the whole system and should be changed. RowaPhos will work straight away in reducing phosphate concentrations in the aquarium but I don’t suppose that that is the meaning of your question. How long will it take to remove the nuisance algae is what people want to know which is harder to answer. Most people if they use the media properly and reduce the phosphate concentration to zero will see an immediate reduction in many types of algae however some others may take several weeks before they disappear altogether but will come back if the strict regime of monitoring and media replacement is not adhered to. When should I start to use RowaPhos on my new tank? It is especially important that you use RowaPhos on your new tank from day one to prevent the phosphate in the water and from any dieback from being absorbed into the rock and tank substrates. Once it has been absorbed it is a lot harder to reduce the tank concentration to zero as the phosphate continues to slowly leach back out over time feeding local algae populations. People with planted freshwater tanks will find that it can take a surprisingly long time to reach equilibrium but having achieved it can expect healthy weed free growth of their plants rather than continual dieback with subsequent phosphate release from concentrations stored in the leaves. 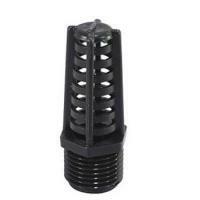 Once established RowaPhos can be used continuously on your tank, as it has no harmful effects on its inhabitants. 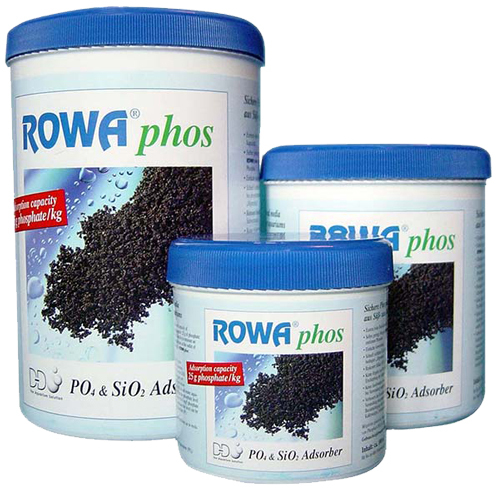 Remember that the Berlin Technical University showed RowaPhos to be the most effective commercial phosphate remover that they tested but if you are not going to use it properly then why waste your money.